"Walkabout" as in "He's gone Walkabout" an Australian term meaning "a journey undertaken without notice or warning, of no fixed duration, with no particular destination in mind, and usually undertaken for reasons of spiritual well being"
I flew over almost the full length of the Maine Islands a few years ago, on my way from WoodenBoat's wonderful office on the shores of Eggemoggin Reach, to Europe to do some seriously humdrum non beating work. I'd had a couple of days of the worst hay fever I'd ever had, but that didn't stop me from almost climbing out on the wing of the little twin jet to get a better view of the wonderful sea and landscape unfolding before me. I'd read Pete Spectre's story some years before, about the Maine Island Trail and the prospect of a series of miniature harbours and camping grounds that would run for several hundred miles. It would never be too far from one island to another for a small boat, always have a sheltered cove or a beach and tentsite within reach, and having a mix of the completely unspoiled, the inhabited once upon a time, and the occasional tiny settlement. I think that some parts of my native New Zealand are pretty good places for cruising an open boat, but this, at least in summertime, was unreal! Some years and a lot of miles in my own boats later, Stephen Paskey who lives an hour or so from the Chesapeake ( My plane landed at Boston so I didn't get to fly that far south, pity) wanted a camping capable cruiser. It had to row well, sail well and have room for one to sleep aboard. Unspoken but also a criteria is Stephen's family. It would be a dirty trick to have a boat so specialised that he could not take three or four crew out for a picnic on that "perfect beach just around the point", so she had to double as an effective family daysailer. (click to enlarge) This drawing shows the simple construction with 6 plywood frames and lapstrake planks over stringers . There is enough built in buoyancy to keep her afloat should the unthinkable happen, and the decked in ends will keep her dry even in quite rough conditions. That coastline is Dory Country, every little port had their own variations on the theme, and I wanted to produce something that would at least look as though it belonged, so a lapstrake dory style hull was the starting point for the pencil and graph paper sketches that are the beginning of all my designs. In correspondence with Stephen I asked about his build, and just as well I did. This guy would stand out anywhere except in an NBA dressing room so the boat got wider to accommodate not only those long legs but the wide shoulders as well. To explain, sleeping in a small boat is too often a fraught affair, requiring the sleeper to balance on rickety contraptions of floorboards balanced across seats, his centre of gravity too high, no headroom under the saggy tent, and no possibility of turning over in his sleep without tipping the boat, sliding sideways and getting wedged under the gunwale as the water pours in over the side. This is supposed to be fun? With some experience in that line under my belt, I drew the sleepers position on the plan, added a couple of inches extra for the sort of shoulders that go with that height, and swore a big swear that I would not trespass on that sleeping position no matter what. I even put the centreboard offset into the face of one of the side seats so the boat is clear right down the centreline. Other considerations were the rowing position and the sailing qualities. To move a biggish boat for hours on end , no matter how slippery she is, the rowers position has to be near perfect, so that too was an inviolable premise. 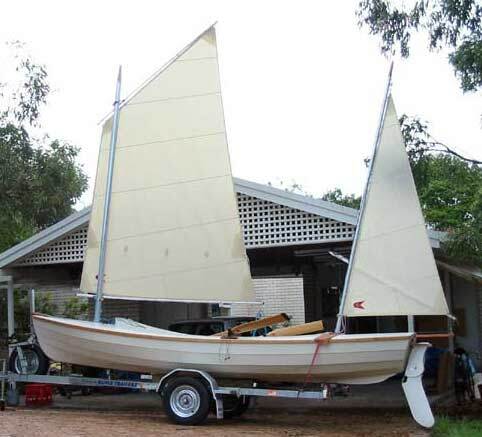 This sometimes does not work well with the boats requirements as a sailing craft, but we've managed here to get a really effective marriage of the two. I also needed to consider how a tent might be best organised, and the boat's sailing qualities maximised considering that some of the passages that might be attempted would be long enough for there to be a good chance of being caught out. Seaworthiness had to be toward the top end of what is normal for an open boat. So a preliminary drawing was done, Stephen said don't change a thing so I was off and running. (click to enlarge) I made more than a passing nod to John Gardner even though being for amateur construction and dry sailed, she is plywood over stringers and epoxy rather than cedar planks and copper rivets. I stood the stem and stern up straighter to gain waterline length, rolled the sides out like a Swampscott for heeled stability, decked her ends over to keep her dry both under way and at anchor, and made the ends long and fine so she would row well even when loaded up for a month away. Masts in the middle of the boat are an annoyance. They get in the road, especially in the light of the other functions that the boat has to fulfill, so I put one at each end of the cockpit. The balanced lug on the main mast is one of the easiest and most efficient of small boats while the mizzen, a "sharpie spritsail", is also very simple. This cat yawl rig is one of the best small cruising rigs about, it's directionally stable, close winded and self tacking, has no stays and very few strings to pull. That mizzen is big enough to hold her head to wind while the coffee brews, the chart is consulted or a reef is tied into the main. Both masts can be struck while at sea, both rigs can be stowed within the boat without interfering with her rowing position, and she can be rigged and unrigged injust minutes. She has lots of buoyancy built in under those decks and in under the side seats that run the full length of the cockpit. It's all accessible for storage of food and equipment. I put a tunnel in under the afterdeck and pivoted the tiller on the mizzen mast step in much the way that the Royal Navy's Montague Whalers did, then ran tiller lines back through the tunnel to a removable yoke on the rudder head. The tiller folds up against the mizzen when not required, and will not need to be dismounted when unrigging the boat for trailering or storing her. To row, there is a seat which simply drops in between the side seat tops, and an adjustable foot stretcher. There is room to set her up for two pairs of oars if you want. For sleeping simply lift them out and roll your airbed and sleeping bag out in a space almost 10 ft long by 2 foot, 6 inches wide. Room for the tall one and his gear without being at all cramped! (click to enlarge) With her tent up she has very comfortable accommodation for the coastal cruiser, and she can even be rowed with the "top" up. The tent is supported by fibreglass tent poles and Walkabouts plans include the details of the tent and its fittings. A tent, vexed subject! I've noted with interest that dingy tents have not kept pace with their land based counterparts, most look like a cross between a Hong Kong apartment on washing day and a dismasted square rigger in a gale! So this one, designed as a part of the boat rather than an afterthought uses a pair of those carbon/fibreglass springy poles in rowlock sockets, a specially tailored cover with enough headroom to sit and row, and roll up side curtains that double as ventilation and rowing ports. A clear section is built in forward and another roll up curtain aft, and I can imagine rowing quietly into a cove while the misty rain drifts down, sheltered and comfortable under the flexible roof, and within a few minutes having the stove roaring away and the bedding organised. I imagine a night at anchor with the spruce looking ghostly against the almost black water, the clatter of a pair of ducks getting up and perhaps the curious sharp cough of a deer the only sounds. Memories of a booming reach with both sails pulling like a train and the boat riding like a duck over the long ocean rollers, of rowing silently a few yards off the shore in glassy calms. The crunch of tiny waves on a shingle beach, memories of sunsets, of deserted islands and unspoiled coves, of morning birdsong and the splash of a fish all combine to make that other world seem very far away.